This film was SHOT in 3D. Most of it was anyway. It’s important for me to say that because a good chunk of the 3D films that have been released, were converted to 3D and don’t have that look that so many of might be looking for… especially if you’ve seen Avatar. With that said, I suggest seeing this in 3D. Or maybe recommend is a better word? I don’t want to say “required” because, I mean I saw the first two in regular old fashioned 2D and I enjoyed them just fine. But that extra dimension is rewarding. The bad news is that the movie is about 2 and half hours long. I think because it was so late and my day was so long, my eyes grew heavy whenever something wasn’t blowing up or there weren’t robots on the screen. And that’s not to say the movie was dry or boring. You need some character development. I think I read somewhere that that’s what Michael Bay wanted to do more of with this film even though it’s the last in the trilogy. And with it being the last one, usually part 3 or the final battle is on an epic scale. I will go forth and say that Michael Bay brought it. While the majority of the war scenes took place in the heart of Chicago, there were plenty of battles and explosions throughout to keep someone who enjoys violence entertained. I think some of my favorite scenes took place on the highway. Actually, I think all three of the movies have a highway battle. 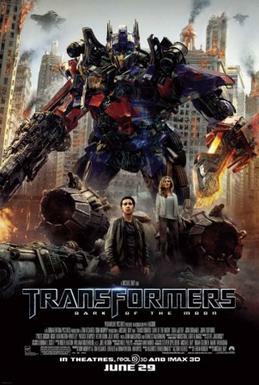 But I must say, this movie finally answered a question for me I had about the transformers since I watched the cartoon: What happens to you if you’re riding in a transformer and he transformers? This is shown. Sorta kinda twice? But I have no complaint. I want to blame my weariness (or maybe the total runtime) but there are some things I missed… like dialogue or a few lines here and there. I need closed captions when some of the Decepticons are speaking. Well, some of the Autobots too. I also missed a post-credits scene. So stick around for that. As of right now, I don’t know what it is about, I just know I needed to get home ASAP to get to sleep. Overall, I didn’t go to see this movie for a well told story or superb acting or beautiful scenery. I went to see things get blown up and/or destroyed. However, I will admit that there was a good story full of twists I applauded yet I felt I needed a bit more for an ending. Or maybe I secretly want a part 4? And the acting… I have no complaints. Most of the characters were the same. There was a subtle reference as to what happened to Megan Fox’s character I found amusing. And you will be amused throughout thanks to Sam, his parents, and Simmons. But there was some terror and sadness. Robots get killed, almost on the brutal violent side, and you actually see humans get killed. Hey, it’s war. Honestly, it reminded me of War of the Worlds at some points. Not too surprising since, ahem… Steven Speilberg strikes again. But folks, movies like this are what summer blockbusters are all about. Go have a good time in theaters. You’re there to have fun, so enjoy the ride. In 3D. Shout out to the group of guys who sat in front of me with the most hilarious banter that kept me entertained until the commercials started playing. I wish I had my recorder with me.